Another unique section of the cemetery is designed specifically for our first responders. Police, Fire, EMS and Emergency Room Doctors and Nurses are crucial to our everyday safety and deserve special recognition for their service. The cornerstone of the section is a surviving beam from the wreckage of the World Trade Center that serves as a symbol and reminder of a first responders commitment and sacrifice that day and every day. The 13,000 pound section of beam and structural steel arrived in Northwest Ohio in the spring of 2016. Welded onto the end of the beam is a jib off of a 1940’s era Bucyrus Erie Crane which signifies a fire truck ladder. At the end of the jib a weighted cable holds an American Flag that was flown over the United States Capitol. It is fastened to an octagonal 70 yard reinforced concrete base which stands 9 1/2 feet tall, designed in the shape of a bolt, symbolizing the American sprit which rebuilt Ground Zero. The beam points 1 degree south from due east directly at the World Trade Center. The 911 First Responders Last Call Memorial is an everlasting gift from The Park in honor of all First Responders everywhere. The monument’s name itself is taken from the “Last Call” ritual, which is observed during the service of a fallen police officer or firefighter. 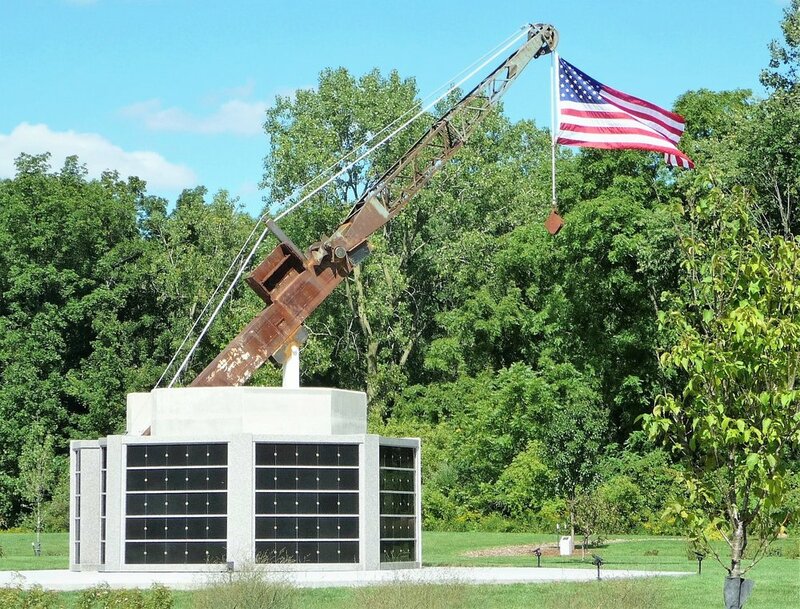 The memorial was dedicated on September 10th, 2016, it arrived via motorcade to its final resting place of honor in the First Responders Section at Toledo Memorial Park. The beam was escorted by The city of Sylvania Police and Fire, Sylvania Township Police and Fire and The Toledo Police and Fire Personnel from Monroe St. in downtown Toledo to it’s home here in Sylvania, OH. The base of the memorial has 185 niches allowing first responders and spouses and/or significant others to become a part of this magnificent memorial. 1,046 graves encompass the memorial providing first responders and immediate family members traditional and cremation burial options with personalized marker(s) and/or monument choices.